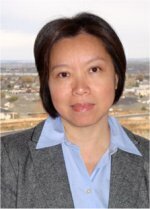 Dr. L. Ruby Leung, a Pacific Northwest National Laboratory scientist who has long been at the forefront of climate modeling research, was recently appointed to serve on the Biological and Environmental Research Advisory Committee (BERAC). As a member of this committee, she will provide advice on a continuing basis to the Director of the Office of Science, U.S. Department of Energy (DOE), on the many complex scientific and technical issues that arise in the development and implementation of the biological and environmental research program. Leung is widely considered one of the top few researchers in the United States and the world in regional climate modeling, and is internationally recognized for her research on regional climate change and the hydrological cycle. In alignment with U.S. Department of Energy (DOE) missions, her innovations cross scientific disciplines to advance the state of the art in predicting climate change and its regional impacts. By delivering more accurate and geographically specific insights for making decisions and taking action, her work has helped DOE and the scientific community to address some of the toughest problems in climate science. Dr. Leung has been named a Fellow of the American Association for the Advancement of Science and the American Meteorological Society. She has published over 80 peer-reviewed papers and book chapters; her research on climate change impacts has been featured in Science, Popular Science, Wall Street Journal, National Public Radio, and many major newspapers. The Biological and Environmental Research Advisory Committee advises the Secretary of Energy and Director, Office of Science, on biological and environmental science issues of concern. BERAC is responsible for periodic reviews of and recommendations for elements of the Biological and Environmental Research (BER) Program; providing advice on competing long-range plans, priorities, and strategies; giving guidance on appropriate levels of funding to develop priorities and strategies; and maintaining balance between competing elements of the BER Program.